Medulloblastoma is the most common pediatric brain tumor, and emerges from the cerebellum. Photo credit: St Jude Children's Research Hospital. 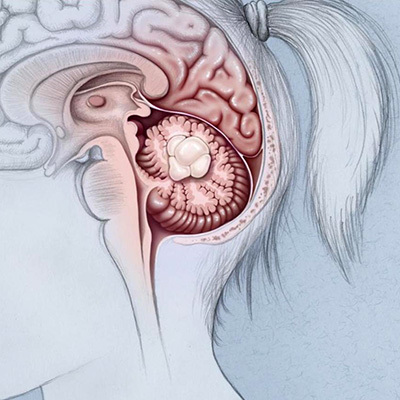 Scientists at Winship Cancer Institute of Emory University (Winship) have a new tactic with potential for fighting medulloblastoma, the most common and most aggressive form of brain tumor in children. The results are published in Cancer Cell. Several emerging anticancer treatments are called "epigenetic therapies," targeting the ways cancer cells shut off genes that could restrain their growth. The new tactic revives a protective gene called BAI1, by interfering with a protein that medulloblastoma cells use to silence BAI1. Reactivating BAI1, with a compound that penetrates into the brain, blocks medulloblastoma growth in mice. Senior author Erwin Van Meir, PhD, says this compound could be a basis for drug discovery and a valuable tool for attacking other types of cancer as well. Van Meir serves as the leader of Winship's Cancer Cell Biology Research Program. "It was a surprise the molecule we identified was more specific than we thought." Van Meir says. "This opens up a new area in epigenetic therapy." Van Meir says that the Cancer Cell paper brings together research in his lab over the last 10 years. His team had originally been studying BAI1, because it was silenced in glioblastoma, another malignant brain tumor seen in adults. They had initially noticed that BAI1 is a regulator of angiogenesis, the process by which tumors attract new blood vessels. "It turns out this is not actually BAI1's most important function," Van Meir says. BAI1 is also a "protector" of p53, which has a role in preventing many types of cancer by monitoring DNA damage – p53 is sometimes called "guardian of the genome." This finding broadens applicability, since BAI1 or its relatives are silenced in several types of cancer, including melanoma, lung, breast and ovarian cancers. Senior research associate Dan Zhu, PhD, the first author of the paper, was able to work out how BAI1 protects p53: by holding back another protein, Mdm2, which tags p53 for recycling. In mice, the interactions between BAI1 and other genes linked to brain tumors weren't clear until Van Meir and his colleagues started looking at models of medulloblastoma. "Once we delved into medulloblastoma, it became very obvious," he says, adding that targeting BAI1 is likely to be effective across the four molecular sub-varieties of medulloblastoma. The compound that reactivates the BAI1 gene, called KCC-07, was identified in collaboration with the lab of Bill Nelson at Johns Hopkins. It interferes with MBD2, a protein that binds methylated DNA. Methylation is generally a modification that shuts genes off, and some epigenetic therapies aim to inhibit methylation, such as azacytidine used against myelodysplastic syndrome. However, inhibiting the process of methylation turns many genes on or off – targeting just one methylated DNA-binding protein could be more specific, Van Meir says. KCC-07 could inhibit medulloblastoma growth in cell culture and in mouse models, and "represents a promising chemical scaffold for further drug development," the researchers conclude. The research was supported by the National Cancer Institute (CA086335, CA163722, CA138292), the National Institute of Neurological Disorders and Stroke (NS096236, NS055077), the CURE Childhood Cancer Foundation, the Southeastern Brain Tumor Foundation, St. Baldrick's Foundation and the Emory Pediatric Research Center.